Since becoming ambassadors we have been really eager to promote the importance of religious education. As an Inter church School supported by the Anglican and Roman Catholic dioceses, we’ve decided to start our campaign by making contact with the people who have significant influence in our faith tradition. This is why we have contacted the Queen and the Pope. We also managed to meet Dr. Rowan Williams and will be contacting Archbishop Justin Welby. We are now planning to contact other world faith communities and we are also hoping to present to Religious Education teachers in Cambridge about what makes religious education a great learning experience for teenagers like us. Another thing we are hoping to start up soon is a link between some schools that have children with other faiths! On Wednesday 1st May 2013, the former Archbishop of Canterbury, Dr Rowan Williams, made a visit to our school. We were pleased to be informed that scheduled into his itinerary for the morning was a meeting with us, the RE Ambassadors. He was interested to learn about our role as RE Ambassadors and he really enjoyed seeing our original entry production video answering the question ‘Why is it important to learn about each other’s beliefs?’ While he was viewing this, we were able to add further insights about why we think RE is such an important subject. He was very welcoming of our views and he encouraged us to get in touch with the Church of England Division of Education and to write to the Times Educational Supplement. He also suggested we contact RE Today to help us in our quest to promote the importance of RE. Following our meeting, we were invited to stay for lunch and socialise with other visitors who had come to see Dr Williams. This was an ideal situation as we were able to introduce ourselves and make possible links. There was a lot of appetising food and we were introduced to school Governors and Diocesan Advisors. It was both fascinating and enjoyable as it allowed us to speak to others about why RE is a crucial subject on any school curriculum timetable. Talking with Dr Williams was an honour and something we will never forget. He said that he would very much like to stay in touch with us and promised to offer his support where he could. We feel privileged that we have been invited to stay in contact with him and exchange regular thoughts about our work with him. On the whole, we found the visit very interesting and helpful. It really encouraged us to find out more about who to talk to and how to talk to them and it gave us an insight into what is happening to RE today. Jasmine said that “The day was very interesting and it is nice he wants to keep in touch.” It was a very good experience and we would just like to thank our school Chaplains, Rev H. Crompton and Mrs L. Currie who made our meeting with Dr Williams possible. We are writing to you today as a group of five students who attend St Bede’s Inter-Church School in Cambridge, England. We have recently been awarded, by the RE Council of England and Wales, (REC) the responsibility of being RE Ambassadors. For the next year, it is our job to promote the importance of RE both locally and nationally. Religious Education is a compulsory subject in all schools in the UK and seeks to teach children about the key beliefs of the six major world faiths. In order to be awarded the responsibility of being RE Ambassadors, we had to apply to the REC responding to: “Why is it important to learn about others beliefs?” We could have answered this in many different ways, for example an essay, film or PowerPoint. As a group, we decided to create a film by using many creative aspects such as rap and a programme called IMovie. Through this film, we showed our ideas of what society could be like without knowledge and understanding of others beliefs, and then what it could be like with such understanding of others beliefs. In the UK, Religious Education outside of Church schools is not holding a strong or central status in education and there is a fear amongst many that RE is being sidelined in favour of other subjects. We are a team of students who believe RE should be promoted because a society which is detached from moral values is a dangerous one. 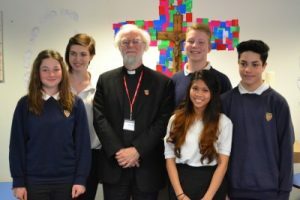 Since becoming RE ambassadors, we have written to the Queen Elizabeth II, designed and created an arts space in our school Chaplaincy for people to express their views of RE, and had a meeting with Dr Rowan Williams (former Archbishop of Canterbury) – which was a great opportunity and it provided us with many ideas for our time as Ambassadors! We hope to continue our work in a great way and meet more influential people such as fellow ambassadors and people that we could share our passion with. It would be lovely to have a response from you as to why you believe Religious Education is important for young people, as this would really support us in our campaign. We also ask that you will join us in praying for school children in the UK that they may be inspired by learning about religion in school. Thank you for taking your time to read this letter, and we hope you understand our passion for Religious Education.